Delivery of the complete turnkey plant. This includes a close collaboration with the customer in the planning phase and the professional assistance in the first period of operation. The high-capacity components and machinery are delivered by German manufacturers. A training for designated operators of biogas plants and CHPs was held in Germany. Industrial enterprises often have a high energy demand. The use of primary energy sources shall be minimized through the energy recovery of organic waste. 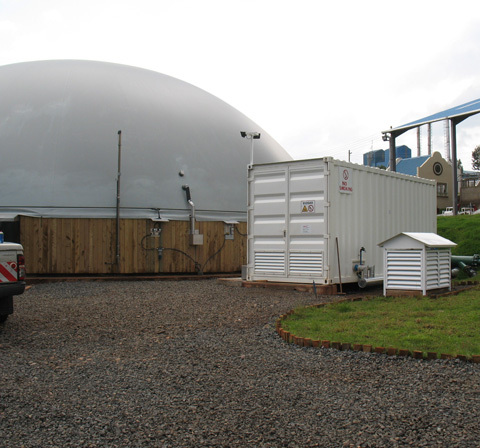 One option is the methane generation through anaerobic digestion. It had to be evaluated if the site-specific organic waste was a practicable substrate for this process. The customer, Finlays Group, is an international company with the main focus on tea, flowers, fresh produce, rubber and forestry. 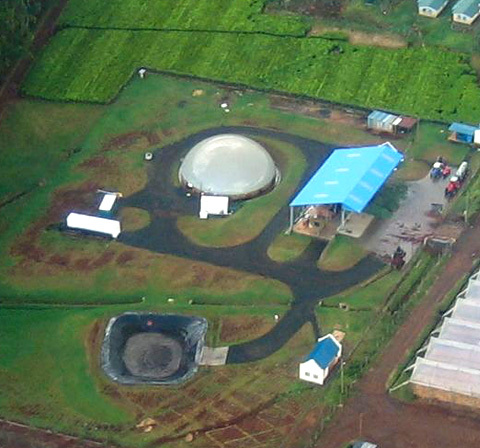 In Kenya their estates accrue possible substrates from tea and flower production as well as slurry from septic tanks. The first expansion stage had to be dimensioned to process 28 tons of substrate a day. Using a combined heat and power system, CHP, the generated biogas should be converted into electric energy and at the same time serve as thermal energy to pre-heat water for steam production. In addition to electric energy production with stabilizing effects on the local power grid an important goal of this project was to avoid the emission of greenhouse gases like methane from dumping waste. Together with the use of process residues as fertilizers in forestry (closing loops) the project aimed to contribute to Finlays’ sustainable development goals like ‘zero net impact’ as minimum environmental standard. An extension of the plant without major complications had to be prepared. Together with the James Finlay Ltd., Erwin Köberle (Biogaskontor) and Tara Consult AKUT was primarily responsible for the project. Following a feasibility study in 2007 the practicability of continuous fermentation of wastes from tea production was tested in a semi-technical trial in the years 2008-2010. Based on the results of this profound research and trial phase and accordance with Kenyan specifics on construction prizes the design and dimensioning, final calculation and planning could be concluded in 2013. The final solution is an adaption to the specific substrate and local conditions. The digester is constructed as combination of lagoon with about 22 m diameter and ring wall out of reinforced concrete. In total the depth is at 7 m. The lagoon and the walls are sealed with a fabric reinforced PE-foil. 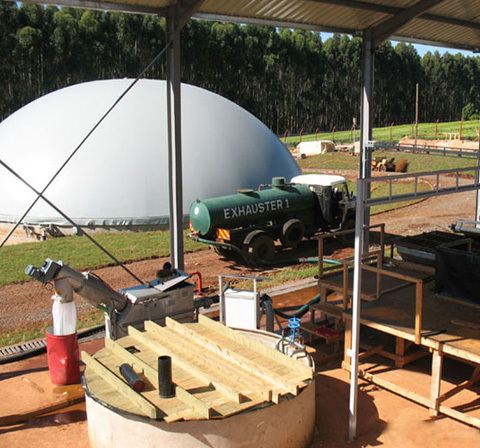 The digester is covered with a gas tight plastic membrane; air inflated for protection against heavy rains and wind with integrated gas holder. All technical equipment is located in a single 20´ container: pumps for mixing and feeding, equipment and panels for measurement and control, the compressor for pressurized air, the register for hot water of heating system, the distribution register for feeding and transport pipes, heat exchanger, compressor systems and electrical supply devices. Moreover the control system is completely automated. For using the gas a new efficient biogas dual-fuel CHPS is implemented which is preinstalled within a "plug and operate" container as well. For further extension of the digestion volume all feeding devices are already prepared to operate with full capacity.